Disney might be saving their big guns for D23, but they weren’t going to pass up the opportunity to introduce their latest heroin to a crowd of people who wish that people would probably let Frozen go already. Attending the panel for the film were Disney Film Directors Ron Clements and John Musker (They’ve worked on everything from The Little Mermaid to Princess and the Frog), writer Jared Bush (Zootopia), producer Osnat Shurer, Amy Lawson Smeed, the co-head of Disney animation , Auli’i Cravalho, the voice of Moana. 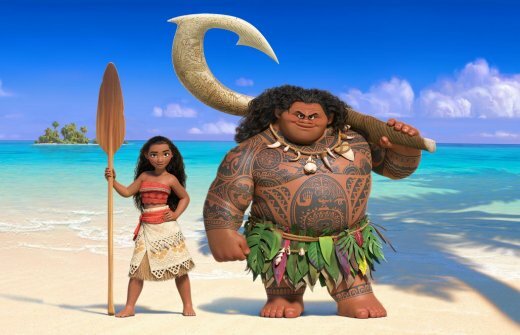 - Directors John Musker and Ron Clements first pitched the idea to John Lasseter five years ago after doing some studying on Polynesian mythology that led to a curiosity about Maui, the Polynesian Trickster God. Lasseter was not all that impressed, so he sent them on a research trip to learn more in Fiji, Samoa, and Tahiti. They talked to everyone from remote villagers to university anthropologists. By the time they returned, they had a much better understanding of the culture and on what to do with Moana. -Clements did a lot of his research on island life and the perspective that gives you compared to life on the main land. It was often reflected in a deep feeling for the ocean by the people he spoke to. That’s what led to the creation of the ocean as an actual character of the film. - In what appears to be a next step past Frozen’s realization that you don’t need the princess to end up with the prince at the end of the movie, there will not be any romantic thread in Moana. This is a tale about empowerment and self-discovery. - Their hope is that this film will help young girls everywhere to feel empowered and to reach out and find themselves. - The traditional Polynesian phrase “Know Your Mountain,” is key to the heart of Moana’s journey. It means having an understanding of what has come before you so that you may better understand yourself and where you are going. - Fans of the opening sequence of Hercules will definitely get a kick out of the way Moana begins. - The stuffed animal that all the kids will be asking for this Christmas is Pua, Moana’s pet pig. Her other animal companion is Hei Hei the rooster. Where Pua is considered adorable, Hei Hei is the dim witted, but well meaning one who usually tries too hard. - On Maui’s character (Voiced by Dwayne Johnson), they mentioned that his tattoos are central to his character. In fact, the one on his chest, called Mini Maui, is actually his concience and we’ll see it annoying him and lamenting the choices that his bigger counter part makes in the film. Additionally, the tattoos brought their own animation challenges as it meant having to animate 2D in a 3D space. - Disney’s Moana comes out on Thanksgiving.